The Union Township Police Department, working in cooperation with the Union County Prosecutor’s Office, is seeking assistance from the public regarding an investigation into a fatal accident that took place last weekend. At about 9:55 p.m. on Sunday, Sept. 15, Carlos Gonzalez Ospina, formerly of Elizabeth and currently a Washington State resident, was thrown from his motorcycle on North Avenue in Union Township near the Elizabeth border, according to Union Township Police Lt. Robert Christie, who is coordinating the investigation. Ospina, 30, was pronounced dead at the scene, Christie said. 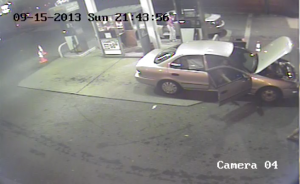 Analysis of video surveillance footage from the area revealed that an unknown person driving a light-colored Chrysler Sebring or Mazda6 sedan made a left turn from the Energy gas station onto North Avenue immediately prior to the accident, according to the investigation. Police do not believe that there was actual contact between the vehicles, but authorities are seeking to identify and interview the driver, who reportedly purchased $10 in gasoline and was wearing light-colored pants and a bright-colored shirt. The driver stopped briefly on the side of the road immediately following the accident before leaving the scene, Christie said. Anyone who recognizes the vehicle or driver in this image is being asked to contact the Union Township Police Department Traffic Bureau at 908-851-5070. Tips also may be given via email at Traffic@UnionTownship.com. All calls will be kept confidential.